Find bright colors and intricate designs when you shop alexandrite necklaces at JTV. The color changing qualities of the alexandrite stone means jewelry pieces made with it match everything. Browse JTV's collection of alexandrite pendant necklaces and other designs at affordable prices you'll love. An alexandrite pendant necklace is a lovely complement to a spring or summer outfit. The way the sunlight catches the green hues of the stone make it stand out. Wear it with a maxi dress, a bathing suit or a t-shirt and shorts combo for equally cute style. Because of the way alexandrite reflects light it is known as the 'emerald by day, ruby by night' gemstone. Explore other gemstone jewelry that gorgeously reflects light like tourmaline rings. 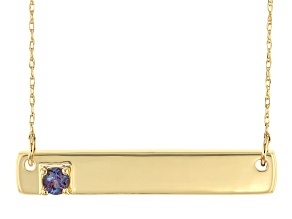 Alexandrite necklaces shine when framed in either silver or gold. Common cuts for the gemstone are oval, square and round. The simple but beautiful designs of alexandrite necklaces give you many accessorizing options. A pair of chandelier earrings is a bold addition to an alexandrite pendant necklace, while bangle bracelets provide balance to your ensemble. Add a magical piece of alexandrite jewelry to your collection with an alexandrite necklace. Explore JTV's entire range of jewelry: from necklaces to rings to bracelets, JTV prices are unbeatable.